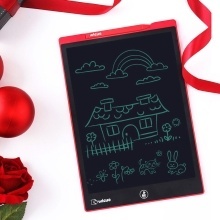 – The 12inch LCD writing tablet without backlight protects eyes, a perfect replacement for paper and pen,can be reused for thousand times. – Pressure-sensitive writing surface with a stylus pen. – One-button erasing, press the button to erase the written content, fast and convenient. – The replaceable CR2016 battery can last for long time. – Ultra-thin and lightweight body, portable to carry; Deaf people can communicate easier. – Magnetic bar designed on the rear, can be used for class note, draft and memo pad, a great helper for children, student, business people, designer, engineers, teacher, etc.